Posted July 12, 2017 by admin & filed under Inner West Independent. Tensions are high as Redfern’s landmark Indigenous hub comes one step closer to its transformation into a 16-storey student housing facility with the submission of the DA for the development’s third precinct last month. The site, known colloquially as ‘The Block’, has been the subject of escalating contention since the Aboriginal Housing Company (AHC) announced plans to turn the former affordable housing site into a 522-room student housing precinct, which will provide leverage to subsidise 62 Indigenous affordable housing dwellings. But opponents of the $70 million project, known as ‘Pemulwuy,’ have grave concerns that the cultural heritage of the site will be compromised by the monopolisation of student housing on the precinct, which some fear will ultimately push the Indigenous and poor out of the area. 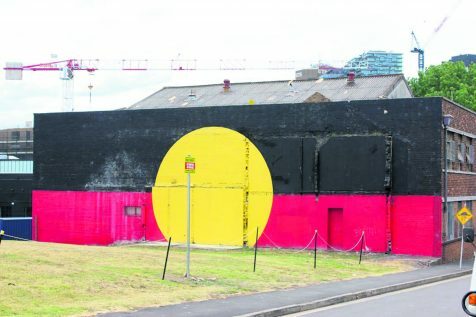 Jenny Munroe, Australian Wiradjuri elder and founder of the Aboriginal Tent Embassy established on The Block almost three years ago, expressed concern that gentrification of Redfern by projects like Pemulwuy continue to cause division within the community. “The Government, in its racism and push to gentrify, which translates to ethnic cleansing is pushing the black people and poor people out of the community and [this] is also happening with the private sector with the Aboriginal Housing Company and in the public sector with the development of the Waterloo Housing Commission,” she said. But according to the AHC, the development of the student housing precinct was necessary as a means of generating the capital required to sustain the affordable housing. But Ms Munroe says that the student housing is at the expense of the Indigenous housing, and that the removal of existing housing from the Block has already created divisions within the community. “A lot of people of the community were forcibly removed out of [the Block] because of the promise to be rehoused, they had to be removed to far western Sydney,” she said. The pushback comes nearly 40 years after the area was handed over to the AHC after Indigenous activists successfully rallied for a grant from the Whitlam Government which allowed the Aboriginal Housing Company to develop affordable housing on the Block. The area famously sparked a public outcry after it deteriorated into some of the most infamous ghettos in Sydney before it was demolished six years ago to make way for plans to develop the area. Protestors now say the development risks compromising the Indigenous heritage of the area, as opponents argue the site’s sole use should be Indigenous housing. But AHC argues that capitalising on the demand for student housing in Redfern is necessary as a means of generating the income to subsidize the affordable housing. “Whilst the AHC is extremely appreciative of the minister’s offer to assist the project with a $5 million grant, during discussions held with ministerial representatives the terms offered alongside this grant could not be agreed,” they said. Geoff Turnbull, REDWatch co-spokesperson said the development will safeguard the community by providing a safe cultural space and facilitating housing for the underprivileged. “I do not think building the Pemulwuy Project will exacerbate the tensions and disagreements already within the Aboriginal community. In fact I think getting Aboriginal housing back on the Block will be a way of rebuilding some of the hope that there will be an ongoing Aboriginal presence in Redfern into the future. But there will be always people who will not agree but that is life,” he said. Ms Munroe is rallying for a watchdog to inspect the books of the Aboriginal Housing Company, saying that there is internal corruption and a lack of transparency within the organisation, which she says is made up predominantly of Mundine family members, after other members were “forced out” of the company’s membership. “There should be a delay on developments until we can have a look at the organisation and its track record,” she said. According to Ms Munroe, the Indigenous community haven’t had a voice within the AHC for a very long time. “It’s an historical grievance that we were inaugural members of the organisation and a lot of the original members were forced out. It closed at 100 so most of people now members are basically family members of Micky or affiliates. “The fact it doesn’t even have to house Aboriginal people anymore- they’ve breached duty of care to Aboriginal people, which the organisation was established to serve,” she said. But the AHC says that their governance and administration remains strong and focused on the improvement of the quality of life of Indigenous Australians, with the project having undertaken community engagement and according to a representative, supported by the community for almost eight years. “The AHC has existed for over 40 years, and the focus has remained on the betterment of the community in its entirety. The board positions are filled by AHC members that are dedicated to facilitating positive change and development in regards to housing, education and employment of Aboriginal and Torres Strait Islander People,” said a spokesperson for the AHC. But Mr Turnbull said such claims around the integrity of the governance of the AHC were previously investigated and found to have no basis. “In the AHC case when Minister Frank Sartor wanted to stop any housing being built by the AHC on the Block in 2005, he raked over everything he could about the AHC rumours to no avail,” he said. The AHC spokesperson said the Pemulwuy development will foster an atmosphere of Indigenous cultural awareness and community, to facilitate cultural integration and ensure the facilities do not deteriorate into a ghetto as they have in the past. “The Pemulwuy Project is one project within an Indigenous Community. Plans are in place to develop educational and cultural experiences within the accommodation, including self-learning on the area and community, celebrating national days, and integrated facilities that will provide cultural integration,” they said. But for Ms Munroe the development signifies another injustice for the Indigenous community, which she says is being “purged” from the area by gentrification. “The reality is that the Aboriginal people not predominant in this community anymore, we’re ghosts, becoming more and more invisible and if the government and housing company keep getting its way we will be pushed right out,” Ms Munroe said.